PanARMENIAN.Net - Henceforth, men invented various schemes to start a family without leaving the reclaimed areas. Some wrote to their relatives and friends asking them to recommend a good woman for marriage, but most often they posted marriage advertisements in newspapers published in eastern states. Women, who were interested, replied, thus stepping into a relationship which resembled today’s communication in social networks. 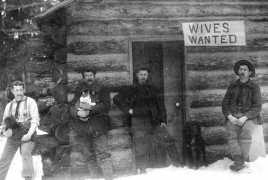 It also happened that women, who couldn’t find a husband nearby, posted a similar advertisement to find the proper man in the west. Replying to the lonely-heart ads, women either wanted to get married soon to put an end to parental control, or escape rumors in the hometown, or just looked for adventures. Sometimes, perceiving the correspondence as a joke, women didn’t fancy that it will result in a marriage. In most cases, both men and women tried to provide meaningful data in the correspondence in order to avoid misunderstanding and disappointment in the future. No one wanted to cover thousands of miles to fall into deception. However, some curious incidents did take place. 22-year old school teacher Elizabeth Berry held correspondence with a bachelor named Louis Draybalbise, who said he was a lonely gold digger. Wasting no time, Elizabeth, who was afraid of spinsterhood, packed her things and headed for California to meet Louis. On her way, her coach was attacked and she was robbed. However, one of the thieves let her keep the suitcase with the wedding dress. At that moment, she noticed a scar on his hand. Upon arrival, Elizabeth put on the dress and went to the judge to seal the marriage with Louis. When listening to her future husband’s oath, she though his voice was familiar. Seeing the scar on his hand, Elizabeth took flight. As it turned out later, Louis was actually a digger, but he sometimes replenished his budget by robbing coaches with his friends. Nowadays everything is much easier. A study conducted the University of Kansas in 2014 showed Americans who married between 2005 and 2012 and met through social networking sites were just as likely to have successful marriages as those who met offline or through other online locations, such as Internet dating sites. And, they were more likely to be satisfied in their marriage than those who met in traditional offline ways, such as through friends. However, experts warn, Internet can unite and separate people as well. Jeffery Dew and Sarah Tulane, colleagues at Utah State University, decided to examine the issue. They studied more than 1,300 randomly selected married couples. Then, they measured their use of television, video games and social networking websites such as Facebook and Twitter. The couples rated their marital quality in terms of happiness in different areas, how often they fought and how likely they thought they were to get divorced. The findings showed that the more husbands used social media, the worse they both felt about their marriage, and both spouses reported more conflict. Women whose husbands spent more time on social media reported lower levels of marital happiness, and they both perceived higher levels of divorce likelihood.